It always surprises me when an injured athlete comes into the office with excessively worn running shoes and doesn’t know how old they are. Were the shoes purchased six months ago, a year ago? Has the athlete been wearing the shoes for more than a year? 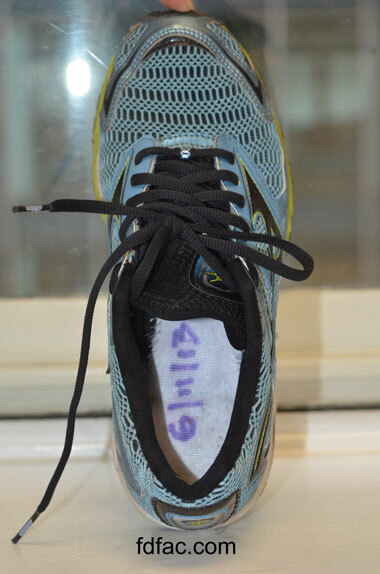 Even though many factors contribute to wear, I always instruct my patients to write the purchase date of their shoes directly on the shoe insole underneath the sock liner to at least give them an awareness of shoe age and wear. Although excessive shoe wear can still occur, it is less likely to occur when using the above methods as opposed to simply replacing the shoes after an arbitrary 300 or 500 miles. This entry was posted in Foot Pain, Shoe Review. Bookmark the permalink. Thank you Dr Jenny for another educational video. I only wish you had an office in New Jersey. I have always dated new shoes on tongue but since cheilectomy and THR on right have used New Balance for the rollbar/stability-first 927 which was discontinued and now the 1540 which was $160-after only 3-4 months walking about 1 mile a day both of these right heel counters have worn through to the plastic-about a quarter size. Am I in the wrong shoe? Could I try a running shoe instead? I realize my gait is off also but I love to walk and maybe should I pad the heel inside-everything I have tried-those stick on heel pads etc. come off and even use the hiking type of lacing to snug up the heel-I need wide as I still have dorsal bunion on left and need the mesh upper. Any recommendation would be greatly appreciated-I am a senior who loves to exercise but cannot keep spending $$$ for shoes every 3-4 months as rest of shoe is in excellent condition-I did all the exam as you suggested in the videos to test worn out shoes! Thanks!! New Balance 1540 has a midsole/outsole structure similar to New Balance 1123. I previously posted about this shoes excessive wear https://drshoereviews.com/2009/11/11/shoe-review-new-balance-1123-excessive-forefoot-wear/. Fortunately, inside heel counter wear does not always mean the shoe needs to be replaced, however if there is also excessive forefoot or rearfoot wear, then the shoes should be replaced. A custom orthotic may also help. At this point, I would recommend you visit a specialty running shoe store as they will be the best equipped to evaluate your gait, determine proper fit and make recommendations regarding wear. Excellent video and great advice! I’m definitely going to pass this information along to all my running shoe customers! Many thanks!